يقع فندق ذا ويستن سيدني، المصمم ليناسب كل الضيوف سواء كانوا من رجال الأعمال أو السياح، في مكان ممتاز في أحد أكثر المناطق تفضيلاً في Sydney CBD. يمكن من هنا للضيوف الاستمتاع بسهولة الوصول إلى كل ما تقدمه هذه المدينة النابضة بالحياة. سوف يعشق النزلاء موقع هذا الفندق، فهو قريب من أهم المعالم السياحية في المدينة كمثل No. 1 Martin Place Health Club, ‪Forgotten Songs‬, ‪Grand Post Office (GPO) Sydney‬ . يقدم ذا ويستن سيدني خدمات لا غبار عليها وكل أشكال اللياقة وحسن الضيافة اللازمة لإسعاد ضيوفه. يقدم الفندق خدمة الغرف على مدار الساعة, خدمة التنظيف يوميًا, مكتب الاستقبال على مدار الساعة, مرافق مخصصة لذوي الاحتياجات الخاصة, تخزين الأمتعة لضمان الراحة القصوى لضيوفه. في الفندق غرف نوم يتجاوز عددها 416، كلها مجهزة بعناية وجمال وبعضها مزود بـ تلفزيون بشاشة مسطحة, سجاد, إغلاق, اتصال لاسلكي بالإنترنت, غرف لغير المدخنين. يقدم الفندق العديد من الفرص للاستجمام كمثل مركز للياقة البدنية. إن كنت تتطلع إلى إقامة مريحة وهادئة في سيدني، فستجد في ذا ويستن سيدني بيتك الثاني. يلزم توفير إذن مسبق لاستخدام بطاقة الإئتمان كمبلغ تأميني عند تسجيل الوصول نظير الرسوم أو الأضرار التي قد تحدث خلال الإقامة. الودائع النقدية غير مقبولة. إضافةً إلى ذلك، مطلوب إبراز وثيقة رسمية للتعريف بالهوية بها صورة عند تسجيل الوصول. لا تنطبق نقاط "ضيف ستاروود المفضل" (SPG) على الغرف التي يتم حجزها على هذا الموقع ولن تُحتسب الإقامة كنقاط للوصول إلى فئة النخبة. السرير الإضافي أمر خاضع للتوافر لقاء رسم إضافي. جميع الغرف في هذا العقار غير مسموح بالتدخين فيها. ستُفرض رسوم تنظيف بقيمة 500 دولار أسترالي على التدخين في الغرفة. يتحمل النزلاء مسؤولية سداد جميع النفقات، والتلفيات الناجمة عن التدخين، وسيُفرض رسم بقيمة 500 دولار أسترالي. يقع نادي Virgin Active الصحي في موقع ملائم على بعد 300 متر من مكان الإقامة في شارع 197 Pitt. يُرجى الاتصال بالعقار للحصول على مزيد من المعلومات. يُرجى العلم بتطبيق رسم بقيمة 1.5% عند الدفع ببطاقة ائتمان. Lovely stay, amenities were great, beds very comfortable. Great spot in Sydney, the pool would have been good for the kids. Very nice hotel, staff are very professional and helpful. Check in/out was easy and it had all everything on site, including many restaurants and bars. The Westin is perfectly located and a nice change from Darling Harbour. Would definitely stay again. A pool would have topped off our staff, unfortunately they no longer have a pool and you can use one nearby, BUT it's adults only. We were 3 generations travelling together only for a couple of nights. Although 3 rooms would have been better because the children had to sleep earlier, having joined rooms meant we could put kids to sleep safely and then adults could have a coffee etc in the other room which made it very reasonable in price. Beautiful hotel and exceptional staff. The porter was obviously in a hurry to take us to the room. Couldn’t get there quick enough., along with some patronizing commentary on the way. But the next morning no porters in sight, so we lugged our own. Not much is really 5 star about our experience except the price. Room decor was tired, we are also both SPG members but neither on arrival or departure was the program promoted to us, must prefer only Marriott rewards members now. We booked to stay in the city after a long flight from Asia as we had an early meeting nearby, the closeness to our meeting was the only reason that we chose the hotel, we would find another next time. Great location, clean and unusually large rooms for Sydney. Great beds. Second time I stay at this place. First time was 17 years ago. This property remains as prestigious and great for a short stay. Everything is nereby: great shopping only a few metres from the hotel. Darling Harbour within 10 minutes walk. Cleanliness of room and common areas, quality and friendliness of staff to be metioned. Clean accommodations and lovely beds that's for sure but certainly nothing special for the price. Standard room size for cbd hotels (small to average), no view (which was not a problem), trying to be over the top fancy with their bathroom but I prefer function over design (basin / tap was not), too much glass and mirror for the cupboard to bathroom area and I felt, for some, the area could be quite dangerous should someone slip. Bathroom door does not stay open, too heavy,, separate bath and shower so you lose moving room space. Comfortable sitting chair. Didn't use the pool/spa as those facilities not required this trip. Check-in took more time than it should of, not enough staff working the counter while double at the SPG (and only one person there). The $8 room service delivery charge is a rort, as menu reads as though the 'superfoods' attracts the extra charge and not the standard, but clearly all do. Three countries now with Westin, I won't be doing it again. I stayed The Westin Sydney hotel many times, the room is modernly decorated, and service is excellent. 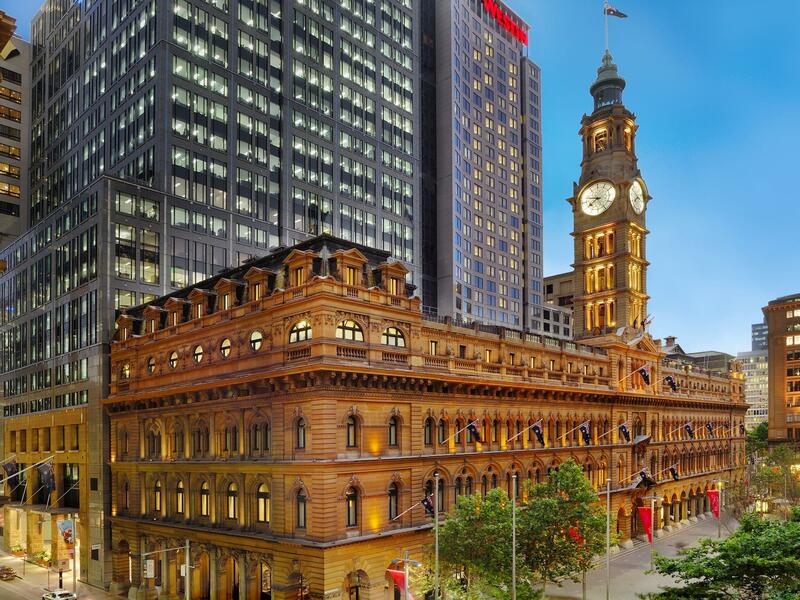 The hotel is in a great location, easy to walk to Circular Quay and the botanic gardens. The tube is nearby too. Concierge were very helpful. Check in was quick and the room was very nice and spacious. I stayed The Westin Sydney hotel many times, the room is modernly decorated, and service is excellent.The hotel is in a great location, easy to walk to Circular Quay and the botanic gardens. The tube is nearby too. Concierge were very helpful. Check in was quick and the room was very nice and spacious. Large room, spectacular view, excellent dining. We had a wonderful stay, the room was extra large with a spectacular view of the GPO clock tower in MRtin Place. Room service was extremely obliging and our meal in the restaurant was excellent with fantastic friendly and efficient service. I have just returned along with my colleague from a very enjoyable stay at the Westin, the location was fantastic for us as we were attending a conference at the Hilton, it was only a 5 minute walk away. Very close to Pitt St Mall & only a short walk to the quay. The room was really clean, the bed extremely comfy & such a spacious bathroom with the shower and toilet partitioned from the bath tub. My colleagues bathroom looked out into the room and she loved that! The same guy checked us in and out and he was great, very polite and efficient (I cant remember his name but my statement says cashier 85!) Having stayed at quite a few other properties in Sydney I would say the Westin is at the top of my list and I will be back! Perfect location but a bit noisy. Quilt is not very comfortable as it is heavy. Executive lounge has great city view. This is a centrally located hotel with a quality service. But you do pay for it. NO pool! Service at check in was not 5 star. Room facilities were basic. Lovely lobby, great location. Clean. Bathroom was good, however only 1 small tube of shower gel. There is a huge bathtub but not enough body wash for a shower and a bath! Ideal location and beautiful building. Needs to have a gym onsite and a swimming pool. It's convenience for our business trip.